Gedik Investment is one of the principal investment banking advisory and brokerage firms in Turkey, providing research and brokerage services to domestic and foreign clients. The company is a member of Borsa Istanbul (BIST) and is authorized by the Capital Markets Board (CMB). Gedik remains a pioneer in the Turkish market and has achieved several notable firsts. To name just a few: the first to use remote access API, access the Derivatives Exchange of Turkey (VOB), claim an option execution on VIOP. In recent years, the Turkish brokerage industry has been falling behind in the financial world with technological advancement. With the majority of brokerage houses still using similar interfaces to their competitors and, existing “boxed solutions”, it was becoming increasingly difficult for them to gain competitive advantage. In addition, the backend infrastructure of existing platforms did not allow the flexibility required for a rapidly changing environment. Gedik needed a new infrastructure capable of consolidating Turkish stocks, futures, warrants and options under a single “Gediktrader” brand. This would enable them to move away from using third party software for each instrument, and offer a new improved service that would give their clients the edge. Gedik also wanted to introduce the scalability option to add new assets into a single trading platform, and integrate with multiple existing back-end systems. We have worked with many European vendors on different projects. They did not have the dedication to integrate with our regional needs. Devexperts has a very good reputation for developing customized solutions, all over the world, dedication and the right team of engineers. This is why we chose to work with Devexperts. 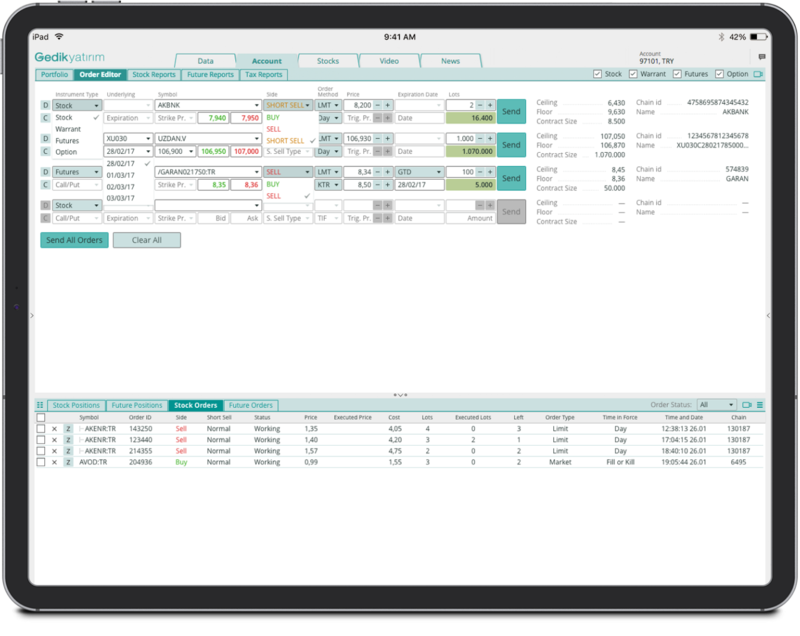 Based on Devexperts retail multi-asset trading platform, the ideal solution for Gedik was dxTrade; an advanced software solution which includes OMS/EMS, risk/portfolio management, on-boarding, trading analytics, compliance, pricing and a pre-trade monitoring server. dxTrade consists of independent modules that are designed for integration and customization into an existing infrastructure, like Lego blocks. The modules were carefully integrated into Gedik back-end infrastructure and modified to support local Turkish compliance regulations. With the fluidity of dxTrade, Gediktrader was completed within 8 months from start to finish. Gediktrader is an all-in-one, multi-asset and multi-platform trading software solution. With “one-click” registration, increasing customer conversion rate, traders can use the software on iOS, Android or an HTML5 web interface. 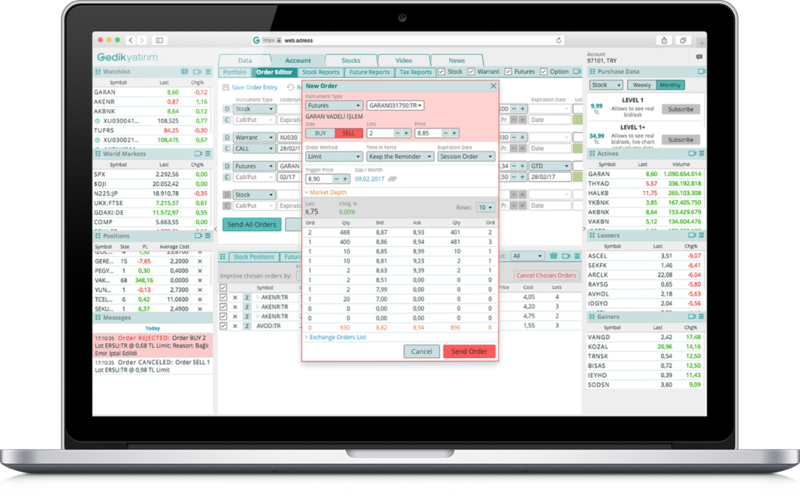 Gediktrader enables the trader to use a single interface to analyze market data and trade multiple instruments (futures, stock, warrants and options). In addition, it is also possible to monitor market news according to an individual’s positions or watchlists and trade from charts – which was first introduced to the Turkish market. 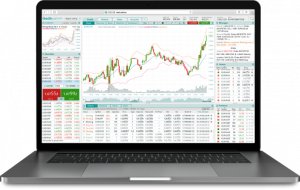 All multiple back-end third party systems are connected via dxTrade to a single trader’s front-end. Gediktrader is connected to the market data provider dxFeed, a subsidiary owned by Devexperts. dxFeed provides a flexible approach to consuming market data based on an individual’s trading style and demands. Gedik Investment can act as a market data vendor, apply client acquisition strategies and introduce loyalty programs. This ability to access market data for a desired period of time also reduces end-users’ trading costs, enables the assessment of risks for instruments on-demand and increase their revenues potential. In addition to providing a new trading platform, Devexperts have established a 24x7x365 maintenance and support service. It is based on a multilayered ITIL process and provides 99.98% year average uptime for real-time trading systems. This allows Gediktrader to concentrate on its core business functions as a brokerage, expand into new markets and increase the number of end users. 2000 new active traders onboard within 3 months thanks to one-click client registration and user-friendly trading functionality. Devexperts has established a scalable M&S infrastructure that allows Gediktrader to host millions of end users, 24×7. With the recent updates Gedik has a 4+ rating in App Store.